For 28 years, a bronze bull was the star of Wall Street, the statue everyone came to see and snap photos with. But in March 2017, the neighborhood got a new heroine, a small but fierce girl defiantly staring down the bull. An overnight sensation, she’s here to stay at least until 2018. A tunnel once abandoned now thrives with graffiti art as an off-limits makeshift gallery. 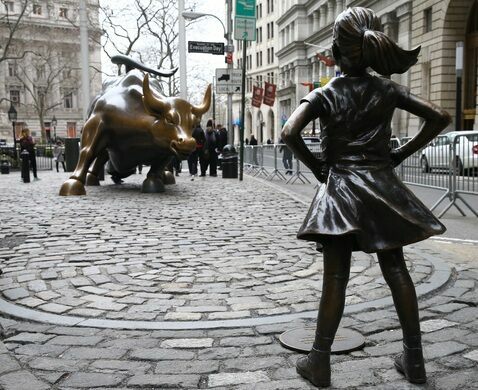 The Fearless Girl, a bronze statue created by Kristen Visbal, was installed for International Women’s Day, standing right opposite the iconic Charging Bull statue in the Bowling Green park in downtown Manhattan. At just 4 feet and 250 pounds, she’s no competition in terms of size, but her fierce hands-on-hips stance and upturned face show that she’s more than a match for him. Commissioned by a financial services firm to advocate gender diversity on corporate boards, the statue in the city’s Financial District became a runaway hit, with thousands flocking to the site to get a photo with the heroine of the hour, and mimicking her pose. An online petition to make the statue a permanent fixture was started and received over 28,000 signatures by the following week. Her superstar status led to city authorities announcing that she would stay at the site until 2018. Update November 2018: The statue has been removed, and will be relocated near NYSE. Now, only her footprints remain in the original location. It is generally extremely crowded with tourists. Avoid going on weekends. A well-worn marker in a forgotten alleyway is all that remains of what had been one of Manhattan's most beautiful buildings. What was meant as an innocent piece of art has earned a reputation as the "mansplaining sculpture."